lease note! Transaq Connector and data access Transaq terminal - are two different things! The platform ATAS have the opportunity to connect through Transaq Connector, through Transaq will not connect. Access to Transaq Connector can be taken separately from your broker. 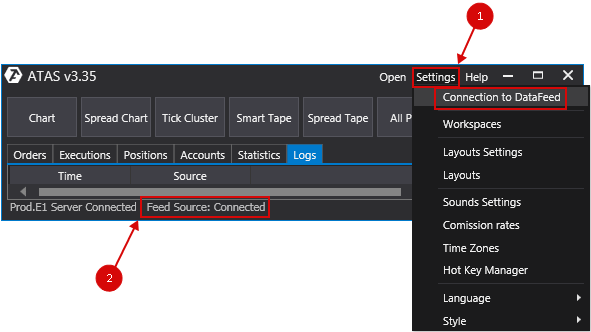 1.Go to the main window menu - Settings, then the submenu Connection to DataFeed. 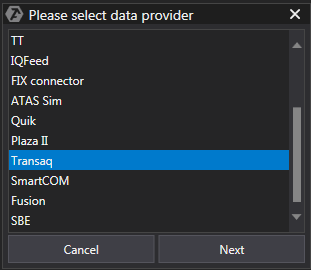 In this window, you select the connection type Transaq and click Next. 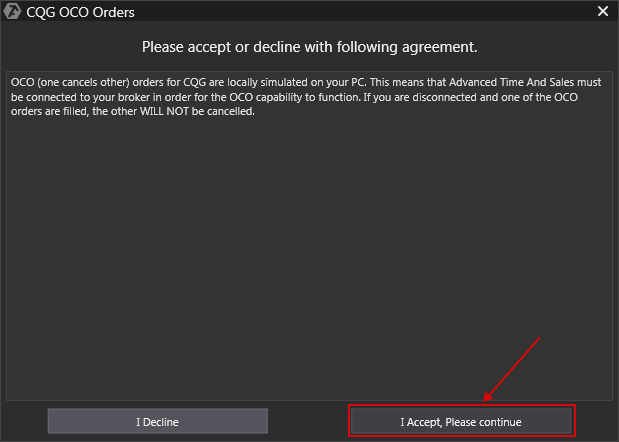 OCO (one cancels other) orders for the Transaq connection are locally emulated on your computer. This means that the platform must be connected to your broker for OCO orders to function properly. If you are disconnected and an OCO order is filled, the other orders of the same group WILL NOT BE CANCELED! 1. Enter your login information (login and password), provided by your broker in the connection window for Transaq connection authorization. 2. Enter the required data in the Host field . 3. In the Account type field, select the type of account: real, HTF or demo. Maximum = 3 (the most detailed log). * High-speed HFT Transaq: a special Transaq trading server, which is located in the M1 data center and has dedicated communication channels to stock exchanges. Special configuration of this server allows achieving a high speed of order execution, compared to the speed with the direct connection. IMPORTANT! Connecting to a high-speed Transaq server is free but is only available to customers whose net asset value on all brokerage accounts exceeds RUB 1,000,000.00. Please note! After the conection, you need to change your password! To change the password, create a Transaq Connector connection, connect, and go to the connection settings. To do this, click on the Change password button, which will appear in this connection configuration window. * Attention: log-files libraryTransaq Connector saved in C:\Users\(user name)\Documents\Advanced Time And Sales\Transaq\log. They need to analyze the problems encountered by employees of your broker. IMPORTANT! Only one quote scource must be connected for Russian and US markets!